Digital marketing is in a constant state of transformation as content becomes the fuel that drives the growth of cross-channel marketing. Cross promoting your business is primarily a matter of partnering with other businesses to create joint advertising while sharing costs. Retailers and marketers understand the importance and potential of multichannel marketing or Omnichannel marketing, but executing it is the hard part. Brands will invest in cross-channel initiatives to build on existing strategies. 40% will implement cross-channel attribution initiatives in 2017. 38% are not currently using user-generated content but would like to do so in the next year. Technological innovation is the most important offering when choosing a marketing services provider. Brands are increasingly turning to marketing service providers and technology for innovation. 49% report that they have a one-size-fits-all approach to communication, which they know needs to be improved. In this case study, you can find quite a lot of brands that have already implemented fantastic cross-channel marketing strategies. This huge collection of marketing channels means that your potential customers could anywhere and you need to be where they are. As the number of potential marketing channels grows even further designing multi-channel marketing campaigns will continue to be key for governing in top-tier customers. Clothing retailer Old Navy is a good example of how to implement on your cross-channel brand message. When followers see the tweet below, they experience a fun-loving brand devoted to helping customers save money on the latest clothing. 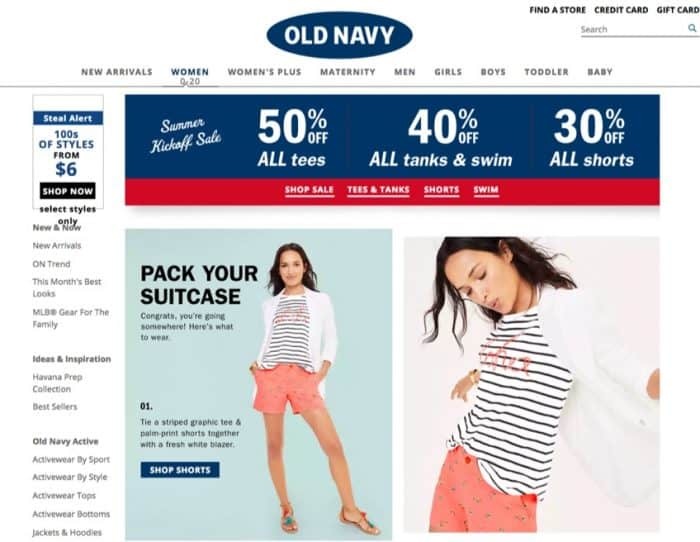 Old Navy stays constant with their message when interested shoppers land on their website. The joyful images are present along with the discounts. 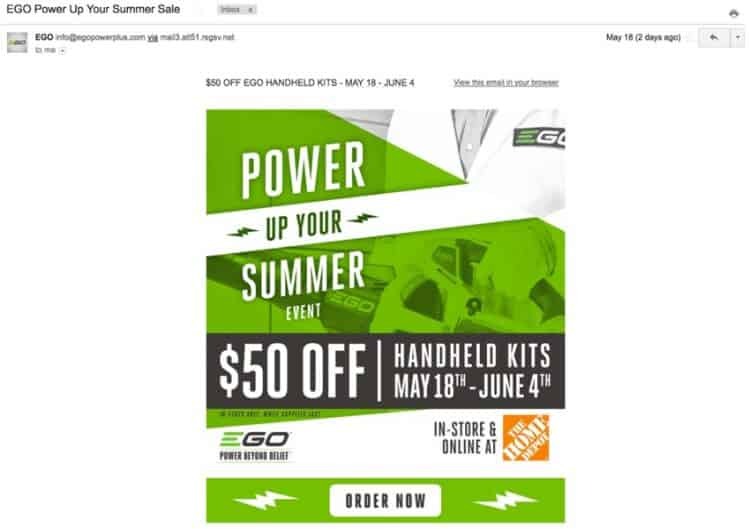 EGO, a manufacturer of outdoor lawn equipment, sends their email subscribers statements about upcoming deals. To redeem the $50 off coupon below, consumers have the option to purchase in-store or online at Home Depot. Starbucks rewards app is one of the top cross-channel experiences. First, you get a free rewards card that you can use whenever you make a purchase. They made it possible to check and reload your card via phone, website, in-store, or on the app. Any change to the card or your profile gets updated across all channels, in real-time. Standing in line to get a coffee and realize you don’t have enough on your balance? Reload it and the cashier will know it’s been updated by the time you swipe your card. An industry leader in multichannel marketing is fashion retailer Rebecca Minkoff. As a brand, it has evolved alongside new marketing strategies and has enjoyed a stronger flexibility to more easily and more quickly invest in evolving digital platforms and new technologies. The campaign, severely promoted on social media (mainly Instagram) invited followers of the brand to get involved by submitting a picture of themselves with their best friend on the brand’s website to create a cool gif, decorated with emojis by illustrator Ana Strumpf. This gif was then followed up by an email asking recipients to submit their mailing address to receive their bespoke gif in the form of a patch via post.